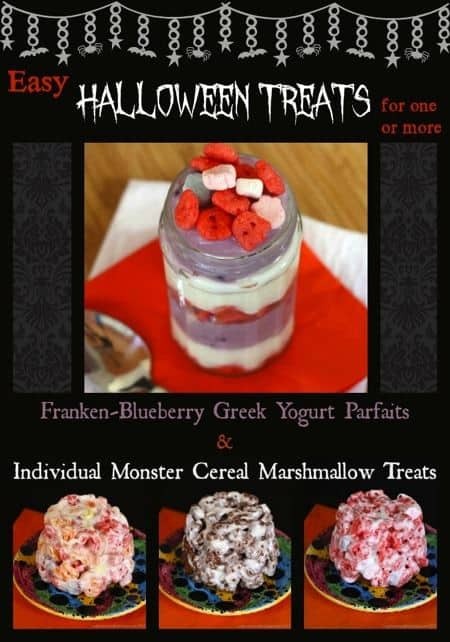 Parfaits made with Monster Cereals and Greek yogurt make a fun but healthier Halloween treat. Disclaimer: Yoplait provided samples of the Yoplait Greek yogurt and General Mills provided samples of the Monster Cereals. As always, all opinions are my own. 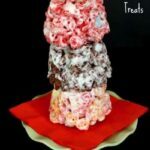 Do you want some quick and easy Halloween treats you can make with your kids, whether you want goodies for one kid or twenty? 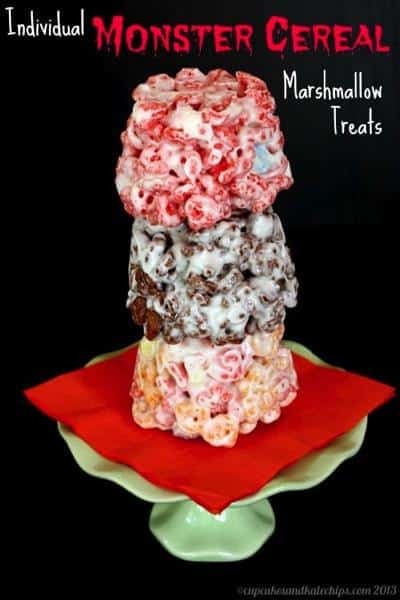 Just a few ingredients plus General Mills Monster Cereals and Yoplait Greek Yogurt (as well as the leftover yogurt cups) and you can make these Easy Halloween Treats – Individual Monster Cereal Marshmallow Treats and Franken-Blueberry Yogurt Parfaits. Do you remember the super-fun General Mills Monster Cereals from when you were a kid? Honestly, I don’t. Well sure I remember the commercials with the cute little ghost and vampire and monsters, but I’ve told you before, mom wouldn’t allow marshmallow cereals in the house. Trust me, it had nothing to do with sugar content. But those dang marshmallows. Now, while I still don’t really keep cereals like these around for breakfast, when General Mills, offered to send me some, I thought they might make some fun Halloween goodies. You know, as a special treat. But since, like a good for blogger, I was making Halloween treats a month before Halloween, and had nowhere to offload them (and had already been eating my weight in Pumpkin Crumb Cake and Pumpkin Greek Yogurt Cheesecake), I wanted to make single-serving sweets. 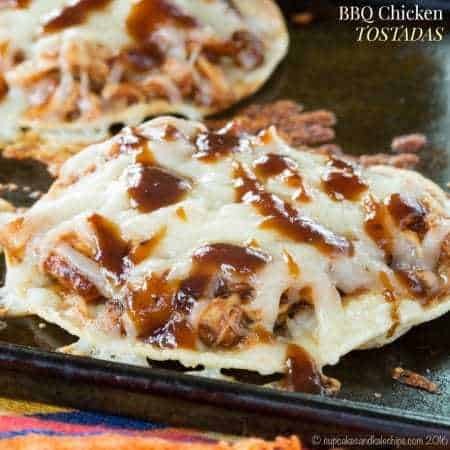 So if you only have one or two kids, but still want to make them something special, then these recipes are for you. 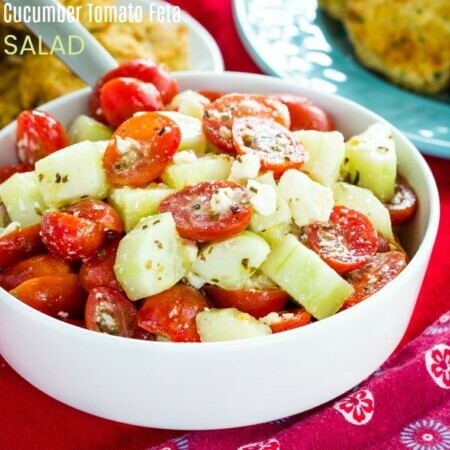 Or if you want to make a whole bunch, it is certainly easy to do that, too. 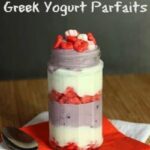 First we grabbed some Franken Berry Cereal and a few containers of Yoplait Greek Yogurt and made some fun parfaits. Now obviously I had to make my pretty ones to photograph, but The Bug got to make his own in his little plastic cup with a lid to take to school for lunch. 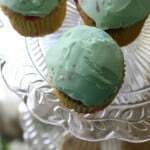 We went with blueberry and vanilla to go along with the Franken Berry cereal, but I am already thinking of some other yummy combos that I might make for The Bug’s Halloween party at school – Boo-Berry with Strawberry-Raspberry and Vanilla, Yummy Mummy with Tangerine and Coconut. 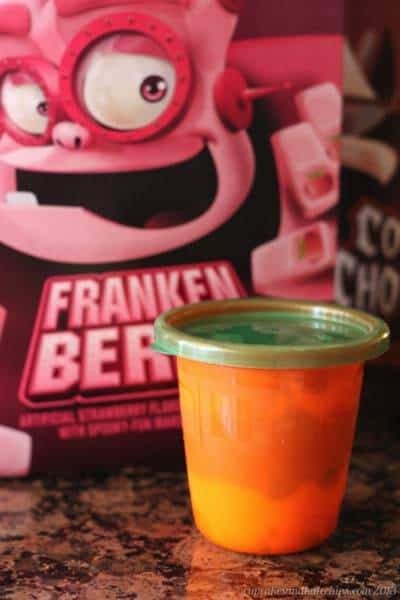 So open up a box of your favorite Monster Cereal, and whip up a little bit of Halloween fun! What is or was your favorite Monster Cereal? 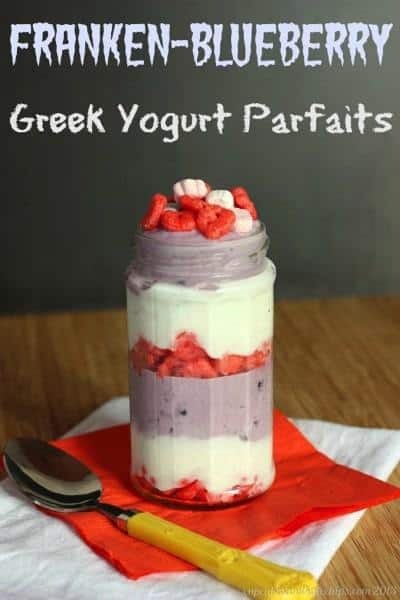 In two glasses, bowls, or cups, put a small amount of cereal in the bottom, a layer of each flavor of yogurt, another layer of cereal, and repeat until the container is full. Single-serving size marshmallow cereal treats for Halloween, made with your favorite Monster Cereal. Place the marshmallows and butter in a bowl, and microwave for 30-45 second, or until the marshmallows start to puff up and just start to melt. 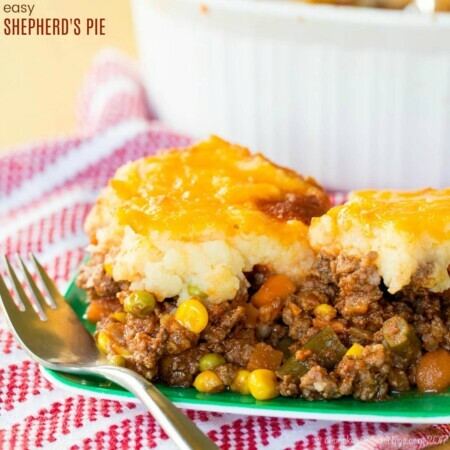 Remove from the microwave and stir until the butter is melted and evenly distributed. Stir in the cereal. 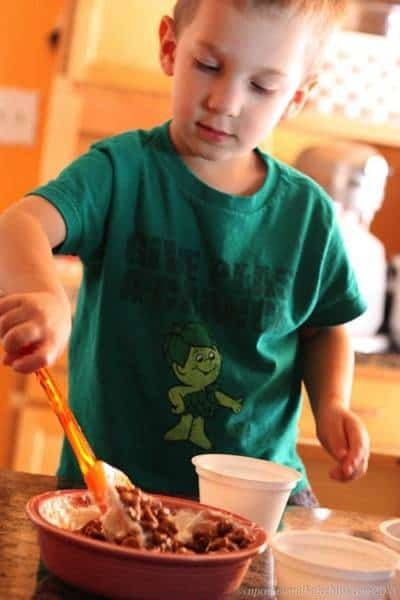 Press the mixture into empty, cleaned yogurt cups or another cup coated with cooking spray, or press into a ball or a bar with your hands (you may want to coat your hands with a bit of butter or cooking spray to prevent sticking). Let cool to room temperature, and remove from your "mold". 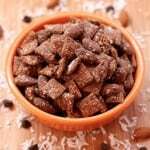 How about some more cereal-y sweets? 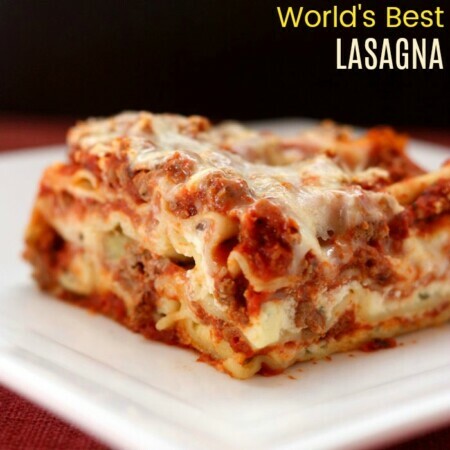 This looks deee-lish! 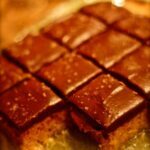 Would love to have you share them at our Super Saturday Link Party! Creative ideas. I love seeing what you did with the cereal! 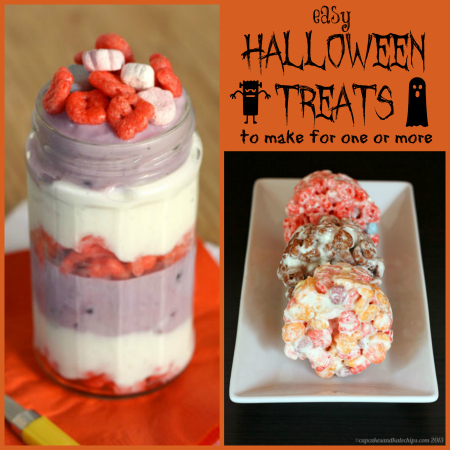 Brianne, these little parfaits look so yummy and what a clever way to make individual marshmallow treats! My boys would love both of these yummies! !